Electrical engineering is frequently about solving problems. Success requires a smart plan of action and the proper tools. But as all designers know, getting started can be difficult. We’re here to help. “In this essay, I’ll cover the “build” portion of the design process. For instance, I’ll detail various tips for prototyping, circuit wiring, enclosure preparation, and more. I’ll also describe several of the most useful parts and tools (e.g., protoboards, scopes, and design software) for working on successful electronic design projects. When you’re finished with this essay, you’ll be well on your way to completing a successful electronic design project. The building phase of a design might include wiring up your circuit design and altering an enclosure to provide access to any I/O on the PCB. Let’s begin with some tools that you will need for circuit prototyping. The nearby photo shows a variety of small tools that I use when wiring a perfboard or assembling a manufactured PCB. The needle-nose pliers/cutter is the most useful. These are my smallest hand tools. With them I can poke, pinch, bend, cut, smooth, clean, and trim parts, boards, and enclosures. I can use the set of special driver tips to open almost any product that uses security screws. Once everything seems to be in order, you can fill up the sockets. You might need to provide some stimulus if you are building something like a filter. A small waveform generator is great for this. There are even a few hand probes that will provide outputs that can stimulate your circuitry. An oscilloscope might be the first “big ticket” item in which you invest. There are some inexpensive digital scope front ends that use an app running on a PC for display and control, but I suggest a basic analog scope (20 MHz) if you can swing it (starting at less than $500). If the circuit doesn’t perform the expected task, you should give the wiring job a quick once over. Look to see if something is missing, such as an unconnected or misconnected wire. If you don’t find something obvious, perform a complete continuity check of all the components and their connections using an ohmmeter. I use a few different meters. One has a transistor checker. Another has a high-current probe. 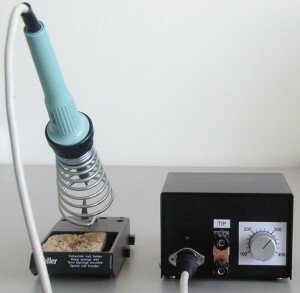 For years I used a small battery-powered hand drill before purchasing the Dremel and drill press. The tweezers are actually an SMT parts measurer. Many are unmarked and impossible to identify without using this device (and the magnifier). It usually will be a stupid mistake. 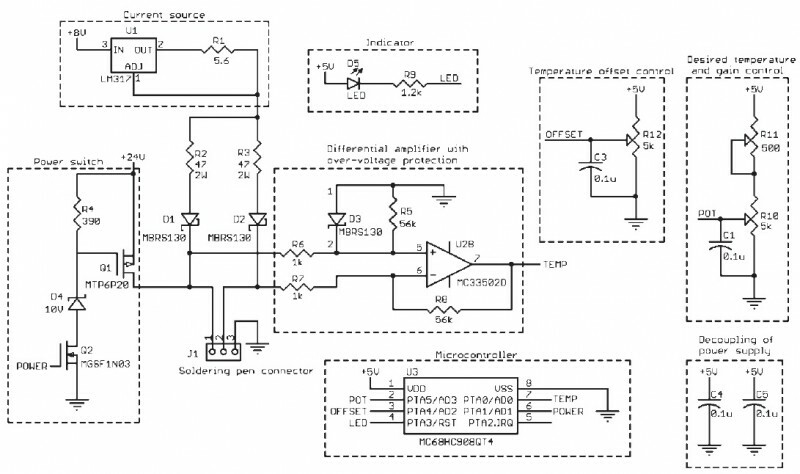 To do a complete troubleshooting job, you’ll need to know how the circuit is supposed to work. Without that knowledge, you can’t be expected to know where to look and what to look for. You’ll likely want to label your design… Once printed, you can protect a label by carefully covering it with a single strip of packing tape. The label for this project came straight off a printer. Using circuit-mount parts made assembling the design a breeze. Ready to start innovating? There’s no time like now to begin your adventure. Check out the upcoming anniversary issue for Bachiochi’s complete essay. Elektor has an iPhone/iPad app for several months. And now Android users can have an Elektor app of their own. The Elektor RF & Microwave Toolbox app is perfect for engineers and RF technicians who need easy, reliable access to essential equations, converters, calculators, and tools. Visit the Android Market for more information about the Elektor app. Circuit Cellar does not yet have an app for Android. The Circuit Cellar iPhone/iPad app is available on iTunes. Elektor International Media is the parent company of Circuit Cellar.